Technology can be great for hoarding small things. I’m allowed to keep all of my photos I’ve ever taken (even though I need to start deleting them). I have enough music to play for days on end and yet not a cd in sight (although I would be happy if I could have a mass amount of records). But most of all, I hoard recipes. I pin, clip, and save at least 10 a day- it is a bit out of control. The problem becomes, I usually decide to make these recipes on a whim with no planning or preparation. This granola was made at 9:00pm on a Monday night just because I felt like having granola. 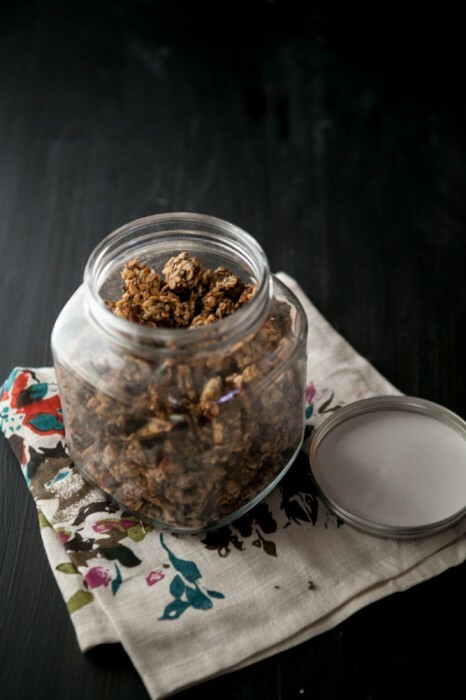 I’ve been saving Kelsey’s Banana Hemp Granola recipe for a while now (a whole month, actually). I don’t find myself at the store during the summer months and therefore rarely have a banana around. After I decided I wanted to make the granola, I ran to the store only to find that all the bananas were barely ripe (for which a quick roast in the oven took care of that problem). This granola is perfectly clumpy and crispy. 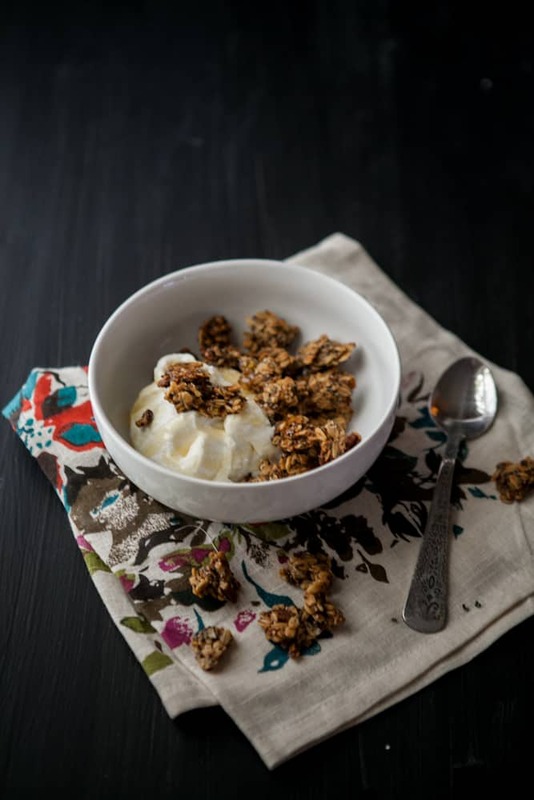 A little greek yogurt, a little honey, and a good size scoop of this granola makes for the perfect meal. I’ve also found myself using just the granola as a quick snack. 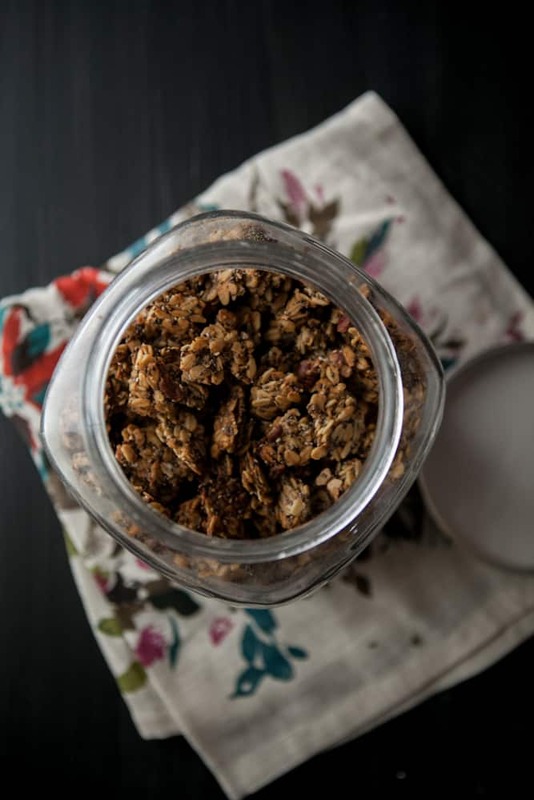 If you want a break from the normal, slightly clumpy granola- I suggest you give this recipe a try! Preheat oven to 400˚. Place whole bananas in the oven and let roast until peel has browned. Remove and let cool slightly. Remove banana from peel and place in the bowl of a stand mixer. Add walnut oil, maple syrup, cinnamon, nutmeg, and sea salt. Mix on medium-high until mixture comes together a bit. Add the 3 cups of oats and let mix on medium-low until oats are covered. Toss in pecans and chia seeds, mixing and adding a few more oats until granola comes together and clumps. Scrap out onto a covered baking tray and return to 400˚ oven. Bake until golden brown, 20-25 minutes. Half way through baking remove from oven and flip granola. *I baked mine but my clumps were rather large and the center was still soft. I let it sit for a while (overnight actually) and it was still not quite crispy. I simply broke the granola in to smaller pieces and returned to the oven until everything was brown and crispy! Okay, this looks fabulous! I have yet to try hemp or chia seeds. I’m so behind the times, aren’t I? This sounds so tasty! I absolutely love this idea! Considering that I hoard granola recipes like crazy, I probably shouldn’t bookmark this. BUT…this really does look like the perfect granola – the one! I have to make this one! 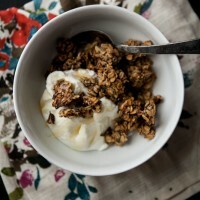 I just made a variation on Happy Yolks banana granola last week! I, too, had to bake mine a bit longer to get the moisture out and get it crisp, but otherwise I loved it! Well well well….roasting bananas is another thing to add to the must-try list! 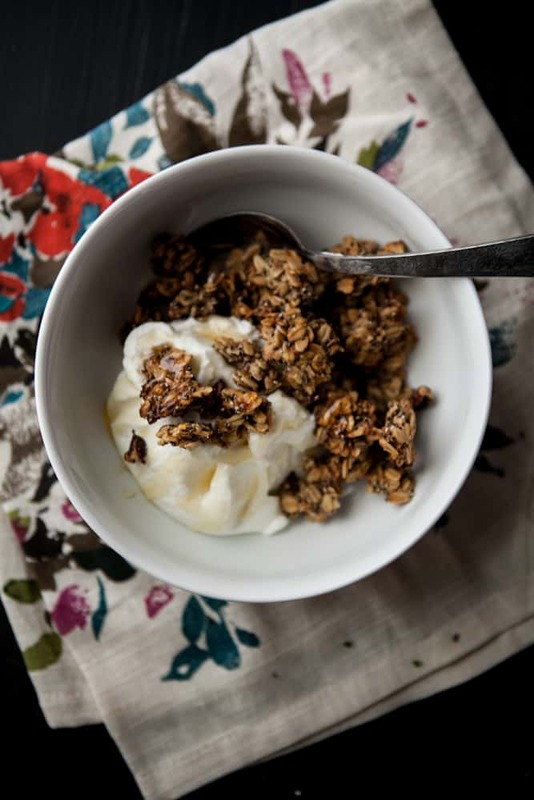 Granola + yogurt + maple syrup and I are all good friends. Wow! I have got to try this!! So your maple pecan granola is a staple in my kitchen, but after making a batch of this today, I think it’s going to have some competition. Hello, I’ve discovered that spreading granola out in a doughnut shape (hole in the middle!) prevents the burnt on the outside/soft in the middle problem. Also, I find that baking it at a lower temperature (300F) over a longer period (30 – 35 mins) helps to crisp up with granola without burning. Hope you will find this useful! – a fellow granola fiend. This looks amazing! I love all things banana, especially granola. Do you think the recipe would suffer if I were to leave out the oil? I realize that most granola recipes involve oil, but I prefer to avoid it if possible. I’ve never tried making granola without the oil so I’m just curious to see if you have any insight. Thanks! Wow, thanks so much for posting this! It is going to help when I buy Chia Seeds online! Beautiful!